The US Craftmaster heat pump is a hybrid electric version that combines the electric and heat pump technology for the improved performance and efficiency, resulting in savings of up to 66% on the annual operating costs. The energy factor of max. 2.78 is one of the highest in the industry. 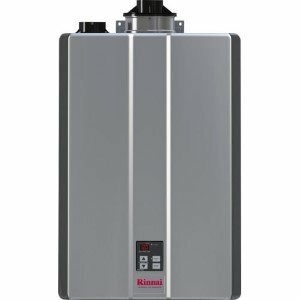 All heat pumps are designed to provide a sufficient amount of hot water, and due to the high-efficient water heating, there will be higher energy savings than the conventional electric type. 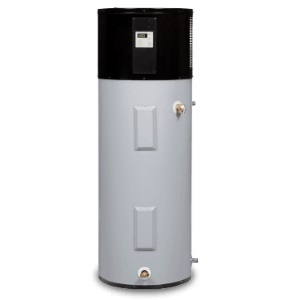 The 80-gal unit, with the first-hour rating of maximum 91 gallons, is recommended for large family homes with more than five members, while the smallest, but a popular 50-gal unit, with the first-hour rating of 67.5 gallons, is good enough for 3-bath homes. The innovative design allows the use of two technologies; electric - represented by the quality upper and lower heating elements and heat pump, which extracts the heat from the surrounding air, for the increased efficiency and Energy Star compliance. Such a combination gives excellent advantages over the standard type, as the energy factor is almost three times higher (2.78 vs. 0.99). The electronic user interface and multiple operating mode systems offer supreme performance and maximum efficiency while operating super quietly for great comfort. The 80-gal model, HPSE2K80HD045V, utilizes the touchpad controls for programming, selecting and monitoring the temperature or one of the operating modes, and the LCD screen to display the operating temperature, operating mode, efficiency and service error codes, if the problem occurs. Other heat pumps use less advanced controls with the LED diodes showing the operating modes, selecting buttons and a digital screen that displays the operating temperature or error codes. Another neat feature is the SmartPort that allows easy connection and control through the home management system so as the utility Smart Grid applications. Hybrid mode. 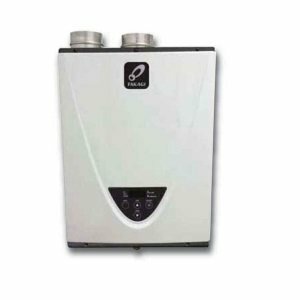 The Hybrid mode combines both heating elements and heat pump for the fast hot water recovery. This is the mode with the highest energy factor. Efficient mode. The Efficient mode doesn't turn the heating elements on, but only the heat pumps, which result in maximized savings. Conventional or Electric mode. The Electric mode is the standard mode when only heating elements are ON, such as in the situation of the surrounding cold air, when the heat pump efficiency is very low. Vacation mode. The Vacation mode reduces the use of the heater when the user is absent for several days and at the same time protects the heat pump from freezing. It allows programming up to 99 days. While the 80-gal unit HPSE2K80HD045V uses the non-sacrificial powered anode, all other models come with the heavy duty sacrificial anode rod, and still providing great protection against the corrosion. Due to its superior characteristics, the powered anode eliminates the need for maintenance or replacement, plus it does not deteriorate over time, reducing the service and maintenance cost and time. With the level noise of 51 dBA, these heat pumps, no matter of the model, still have a very quiet fan, and it can be said that they are almost whisper-quiet. 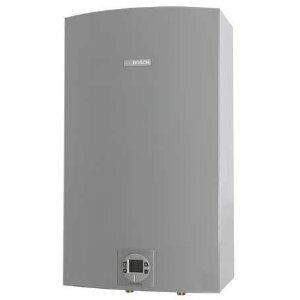 The 50-gal model has the highest energy factor of all models, higher than other models; it is 2.78 vs. 2.71 for 66- and 80-gal unit, so according to the manufacturer the heating costs can be reduced up to 66%. The water temperature can be set between 95 F and 140 F, or 95 F and 150 F for the larger unit. With the high efficiency and the First Hour Rating close to 68 gallons, this unit is perfect for 3-bath homes. Comparing 80-gal models: Model HPSE2K80HD045VU comes with the highest energy factor of 2.72, comparing to 2.33, for the HPSE2K80HD045V model, when operating in the hybrid modes. Even the First Hour Rating is higher, 91 gal. vs. 84 gal., in hybrid mode as well. Model HPSE2K80HD045VU, due to its smaller size 69" vs. 82", is recommended for places where there are restrictions in the room height. When it comes to the size, the 50-gal model is much smaller than the 80-gal unit, its height is approximately 41" and 22" in diameter, while the other model is 82" in height and 24" in diameter. US Craftmaster heat pumps come with the warranty of 10 years on the tank and all other parts.